You'll be £24.50 closer to your next £10.00 credit when you purchase The Great War Illustrated 1915. What's this? The second in a series of five titles, which will cover each year of the war graphically. Countless thousands of pictures were taken by photographers on all sides during the First World War. These pictures appeared in the magazines, journals and newspapers of the time. Some illustrations went on to become part of post-war archives and have appeared, and continue to appear, in present-day publications and TV documentary programmes – many did not. The Great War Illustrated series will include in its pages many rarely seen images with individual numbers allocated and subsequently they will be lodged with the Taylor Library Archive for use by editors and authors. The Great War Illustrated 1915 covers the 1915 Gallipoli campaign and the battles that commenced on the Western Front that year. Some images will be familiar – many will be seen for the first time by a new generation interested in the war that changed the world forever. With over 1,000 painstakingly restored images, this will be a definitive picture reference book on 1915 and will appeal to enthusiasts, collectors and student of the period alike. As a source of documentation for our figures, cartoons, dioramas, tables, etc, it is an valuable visual information. An indispensable and essential work that can not fail in our library and you have to get at any price. Read the full Spanish review here! The pictures are always informative and often fascinating. Military modellers specializing in the period will love this book. There is less for wargamers but the photographs illuminate the battlefield and highlight the combat experience and that is valuable for any historical wargaming period. Naval wargamers will be particularly impressed with the warships. Ultimately, this is a book to sit and enjoy and I highly recommend it. An unusual book but one that has enthralled me for the last week. ...if you want interesting and well presented pictures of how the battlefield of 1915 looked then this is perfect. Pen and Sword should congratulated for the effort that has gone into this work and I look forward to the remainder of the collection getting a similar treatment. This weighty tome is packed full of archive black-and-white and colour photos of 1915 and is a veritable treasure trove of over 1,000 images. The colour pages are remarkable to say the least. This is a superb collection marking the 100th anniversary of 1915 and anyone interested in the Great War will want to own one - which is why this copy is already in the Great War's office library! Excellent series, very fine selection of photos and colourations. Very nice book with photo's that are clear and full of detail. Good. Great selection of photographs, many of which had not been published before to my knowledge, worthwhile purchase if studying the First World War. Medal dealer Peter N Taylor of Barnsley was obviously something of a squirrel and amassed a huge collection of photographic images from the First World War. Many of these will be familiar to those of us who have contemporary publications in our own collections, but there are photos here which have not been seen before. ... This is the definitive picture reference book about the war year 1915; it will appeal to military historians, collectors and students of the period alike. The series will grow into an unrivalled pictorial record of this great conflict and will be a singular resource for historians and author. It is remarkable value for money. The method of the previous volume is repeated here with a mass of imagery squeezed into every page. There is no apparent subtlety and the photography acts like a shrapnel shell bursting with ideas and impressions. But, boy, does it work! ... If you are looking for an entertaining history of the war then you will find a big slice of it in this book. The authors look beyond the photographs to the attitudes and spirit of the times to arrange things in context. This is crucial to the success of this book. The thing I like most is that there is not too much interpretation or analysis. The authors allow the photos to speak for themselves and allow us to work out things for ourselves. You could do a lot worse than flip through this book while filling in gaps with one of the wikiwotsits. There are also a small number of fantastic websites dedicated to the Great War where you will also excellent information and insights. Embrace it all. The authors tap into a rich vein of events, people and artistry to bring that awful year, 1915, to life. If the next volumes are anywhere near as good as this one they will have succeeded in producing a wonderful set of books, well worth having, by anyone interested in military history. This hard-cover book covers just the second year of the Great War, and the authors have assembled over 1,000 archive photos to tell the story of the year, and when it is still worth remembering that 3 more years of death and destruction still remained ahead. The bulk of the pictures are in black and white but there is also a section with some interesting colour photos as well. It opens with naval actions, and the sinking on 1st January 1915 of the sinking of HMS Formidable, with the loss of 512 men, after being hit by a torpedo from U-24. Later in the same month, British and German naval units clashed near the Dogger Bank in the North Sea. HMS Lion was damaged but got back to port, whereas the German SMS Blucher was sunk. The naval theme continues and takes us into the campaign in the Dardanelles and then the sinking of the Lusitania. Chapter two looks more at the war in the Middle East and Gallipoli and with an extensive collection of pictures. Chapter three moves to the Western Front and the Battle of Neuve Chapelle with pictures covering both British and German sides of the trenches. Chapter four deals with the second Battle of Ypres, Hill 60 and the use of gas. Again a mix of coverage from both British and German sides, from the destruction of the Cloth Hall in Ypres centre to a precarious mount for a German 77mm field gun set up into an improvised anti-aircraft position. The use of gas is covered with picture of casualties as well as troops of both sides wearing protective masks of one sort or another. Chapter five then moves to the air, and the Zeppelin raids. Chapter six looks at the New Army, and thousands of conscripts had to be introduced to military service and trained. New weapons that were being developed at the same time, and you get a good idea of the vast number of shells being produced for the ever developing artillery arm. The final chapter, number seven, looks at the Battle of Loos. Pictures of a blasted landscape give a good idea of the devastation wrought on the area and the casualties that were inflicted on both sides. It is a large collection of photos, with well informed captions, and which together give an excellent indication of the important events from this second year of the Great War. There are so many books being published about The Great War, yet this is superior to so many. 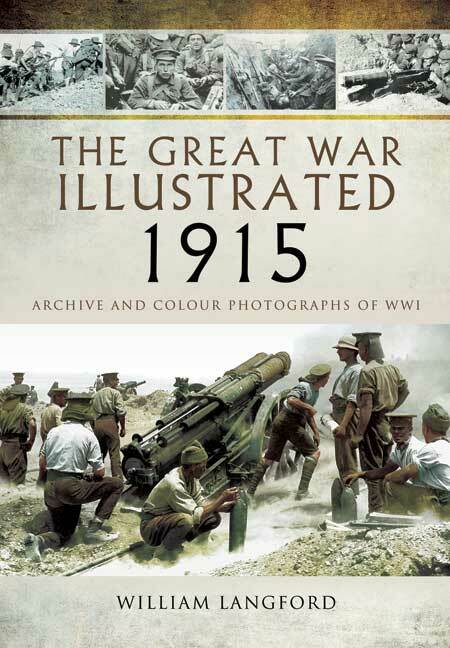 Featuring over 1,000 painstaking restored photographs, with just the right amount of text to put the images into perspective, and beautifully designed, quite simply, if you had to buy only one book on 1915 in The Great War, it has to be this one. You will literarily get a lifetime of use out of it, and every time you go back to it, you will see some detail you have never seen before. William Langford has been employed in printing and publishing for fifty years. His works for Pen & Sword include: The Great War Illustrated 1914; Great Push – The Battle of the Somme 1916; Somme Intelligence and They Were There! 1914.